During the holidays it can be especially difficult to navigate all of the party food and find something you can tolerate. 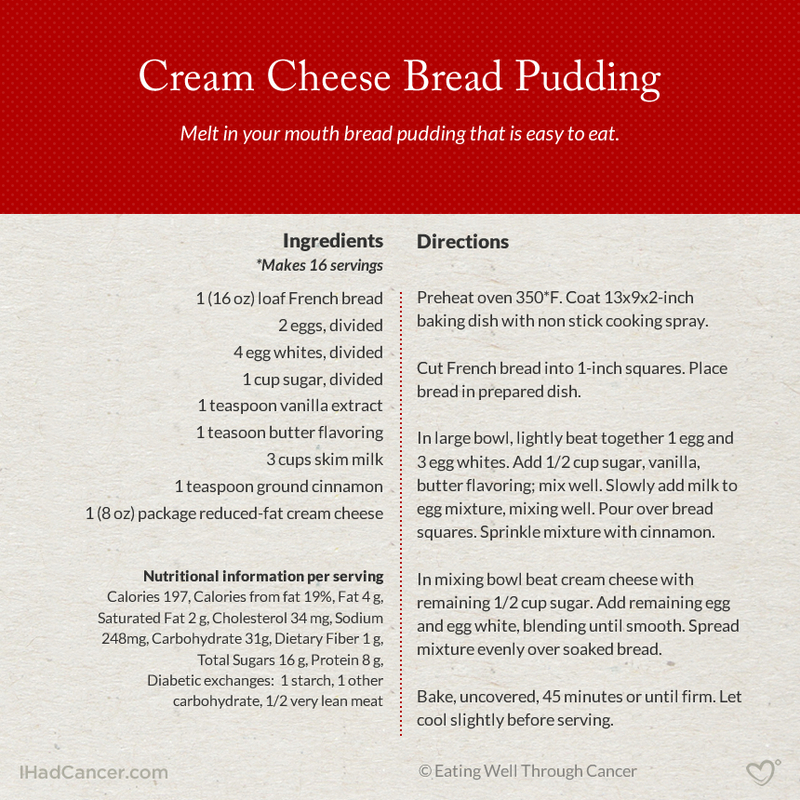 For your holidays this year, I'd love to share with you one of my favorite recipes from the "Sore Mouth and Throat" chapter of Eating Well Through Cancer. 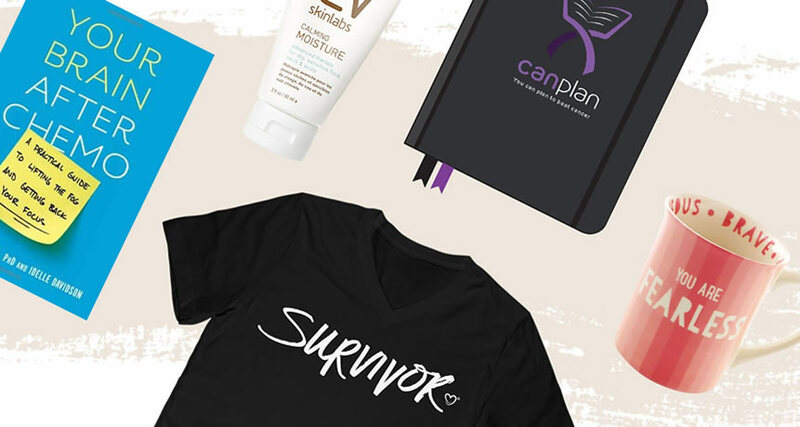 For myself, cancer hit home when my father was diagnosed with larynx cancer. Anyone affected by cancer knows that patients lose their strength and appetite while fighting the disease. I have included tasty recipes that are easy to prepare and easier to tolerate when experiencing this symptom. As a caregiver, I've personally seen that a sore mouth or throat due to cancer treatment can make it difficult to maintain a healthy diet. If you find one food that you can tolerate, do not hesitate to eat it repeatedly. Your mouth normally will get sore 7-10 days following certain chemotherapy treatments. Mouth soreness is usually associated with a low white blood cell count, so as soon as your counts rise, the soreness will resolve. A healthy diet can keep up your strength and immune system and what you eat may make a difference in how well you handle treatment. With an awareness of the foods best tolerated and those that ease the symptoms of treatment, you may be able to eat well and stay properly nourished. Have a great holiday! Avoid tart, acidic, or salty foods and drinks such as citrus fruit juices (grapefruit, orange, lime), pickled and vinegary foods, tomato-based foods, and some canned broths. Avoid rough-textured foods, such as dry toast, granola, and raw fruits and vegetables. Eat food that is cool or room temperature. Very hot or cold foods can cause discomfort. Limit alcohol, caffeine, and tobacco. These substances can dry out your mouth and throat and cause further irritation. Avoid spices such as chili powder, cloves, curry, hot sauces, nutmeg, and pepper. Season foods with herbs such as basil, oregano, and thyme. Softer and easy to swallow foods include soft, creamy foods such as cream soups, cheeses, mashed potatoes, pastas, yogurt, eggs, custards, puddings, cooked cereals, ice cream, casseroles, gravies, syrups, breakfast-type recipes, milkshakes, and nutritional liquid food supplements. Melt-in-your-mouth bread pudding that is easy to eat. Speaking of the last bullet, this recipe is ideal for anyone who's had a hard time getting food down. It's soft enough for anyone with sensitive spots or sore throats, and the spongy bread is filling without feeling heavy in your stomach. Plus, the tanginess of the cream cheese will wake up some of your tastebuds without upsetting your stomach or skipping on flavor. Click the image below to download the recipe. What's your favorite holiday recipe? Share in the comments below or sign up here. With over 1 million cookbooks sold, best-selling national cookbook author, Holly Clegg has released her 15 Year Anniversary edition of Eating Well Through Cancer, (English, Spanish and Chinese editions). Clegg has appeared on Fox & Friends, NBC Weekend Today, QVC, The 700 Club (and appearing again on November 10, 2016), USA Today, Cooking Light Magazine, Web MD, and Huff Post. She has consulted for Walmart, Teflon, The Coca-Cola Company, and hospitals throughout the country. Visit her YouTube channel and blog, The Healthy Cooking Blog.